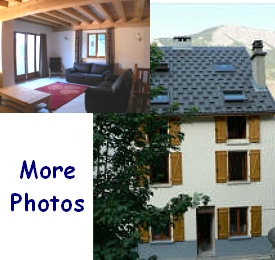 Holiday Homes in Bourg d’Oisans, France. Oisans is synomymous with the legendary Tour de France mountain stages. Alpe-d'Huez, Les 2 Alpes and Bourg d'Oisans have left their mark on this race and are part of its living legend. Oisans hosts spectacular mountain bike competitions such as ‘Megavalanche’, the longest MTB downhill race in the world, starting in Alpe d’Huez and finishing 30km and 2800m further down in the centre of the village of Allemont. From small country roads to solitary mountain passes lost in the clouds, Oisans is a very popular area for cycling. Come and explore the six valleys of this fantastic area with its winding roads, its perched villages, sitting on mountain tops like eagles’ nests, or its more gentle roads opening up its hidden valleys. As you will see, each road has its own history and each village has its own distinctive character. The ‘30 Cyclo Tourisme’ guide lists 30 routes all starting from Bourg d’Oisans, including the infamous 21 hairpin bends to Alpe d’Huez, as well as some less strenuous routes suitable for all the family. There are events for everyone to participate in and with the cable car open all year round, the route up the mountain could not be easier! 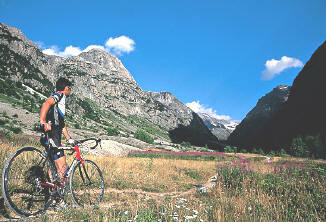 Bourg d’Oisans caters well for cyclists, with extensive hire shops for all types and quality of bike hire. Whether you choose the peace and tranquility of fishing or the excitement of white water rafting, you can find it here, with over 200km of streams and rivers and many mountain lakes. Sailing, kayaking, rafting and canyoning, swimming pools, fountains in the summer, the water offers a wide range of refreshing possibilities and charms. 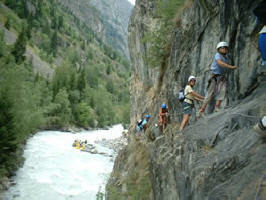 The Bourg d'Oisans Children's Club is open July and August for children aged 4 - 14. Numerous activities: rafting, bowling, laser-games, picnics, trampolining, swimming, accrobranche tree climbing and sports tournaments. 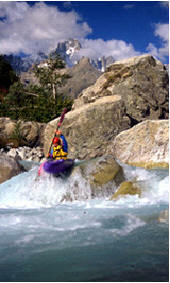 Ice skating, toboggan runs, climbing walls and a host of other activities are available in Alpe d’Huez and Les 2 Alpes. Children’s clubs and free entertainment across the region are on offer for your kids to have a dream holiday. There’s plenty for the teens too with challenging sporting activities, karting, horse riding and even summer skiing on the high glaciers to occupy their time! Weekends, Short stays, 10 or 11 day stays all available. Pricing is for a maximum of 8 people and does not include cleaning and bed linen hire. A small supplement is payable for parties of more than 8. Combining 300 years of French tradition with modern spacious living these two stunning self-catering properties for up to 10 guests and 12 guests provide a true home from home and ideal base from which to explore the stunning scenery of the Oisans region. Ideally located in the centre of the village, 50m from the children’s play park, duck pond and picnic area and just 5 minutes walk from the fantastic open air swimming pool. 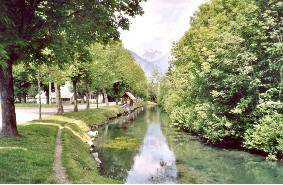 Bourg d’Oisans is an hour from Grenoble airport and an hour and a quarter from Lyon. Perfect for families and groups of cyclists alike these neighboring houses have been finished to a very high standard with Leather sofas, Flat screen TVs to enjoy the extensive DVD Libraries and XBox, all mod-cons in the kitchen, high quality mattresses and feather pillows and luxury bathrooms. All Bedding is 100% cotton and there is a mixture of feather and synthetic pillows as well as duvets and an additional blanket for each bed. Two hairdryers, iron and ironing board at each house. A charming village where all roads meet, set amidst untamed nature and internationally renowned ski areas, Bourg d’Oisans welcomes you with simplicity and authenticity. Whether in summer, winter, spring or autumn Bourg d’Oisans is your gateway to the mountains and all they have to offer: culture and heritage, sport, relaxation and exploration of un-spoilt nature. Whether you wish to relax with the family or enjoy exhilarating mountain sports, Bourg d’Oisans is the ideal base for a holiday. Its convivial atmosphere, fabulous outdoor pool with corkscrew slide and toddlers pool, many shops, wide choice of bars and restaurants and vibrant Saturday market are simply idyllic. For just relaxing and soaking up all this friendly village has to offer take a walk along the banks of the cold mountain river, enjoy time at the children's play park with traditional village pond and stop at one of the many picnic benches dotted around. 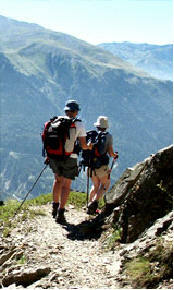 Oisans has such extraordinary natural heritage that a National Park, the Ecrins, was created to protect it and enhance the environment. It is the largest national park in France with over 680km of way-marked trials ranging from simple strolls to adventurous hikes. Surrounded by the majestic mountains, whatever path you choose and however difficult, the setting is sure to be memorable. Be at one with the mountains in complete security. The ‘Via Ferratas’ are protected rocky scrambling routes. Thanks to the ladders, ramps and cables fixed to the rock face you do not have to be an experienced climber to find yourself perched on a rock face. "Cycling is a constant lesson in humility." Take your maiden flight. 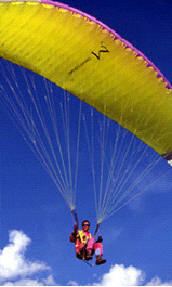 Paragliding courses for beginners, tandem jumps and advanced courses all available. Weekends, Short stays, 10 or 11 day stays all available. Please contact us for pricing. Photo Gallery Your browser does not support inline frames or is currently configured not to display inline frames.